NAD C 538 review | What Hi-Fi? The arrival of a new CD player is no longer a regular occurrence at What Hi-Fi? towers. What was once a torrent of shiny new disc spinners has now slowed to a sporadic trickle, thanks firstly to download sites and then the subsequent rise of streaming services. Ironically, the revival of interest in vinyl hasn’t helped either. NAD is no stranger to making CD players. 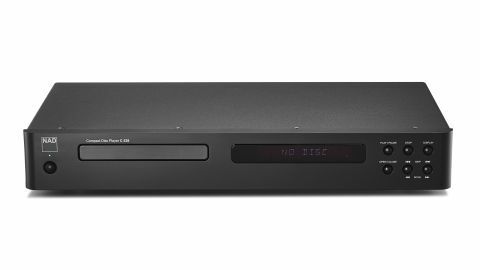 The company’s history is littered with five-star products and Award winners, and this new one goes into a sparse sector where the shadow of Marantz’s pricier, but truly excellent, CD6006 UK looms large. The launch price for the Marantz was £450, well above the NAD’s retail, but having dropped to £285, it is now a very close rival. There’s no mistaking a NAD CD player for anything else. The company seems to have followed the same style notes for decades, and the C 538 bears many similarities to its forebears. Still, there’s not much to complain about when the result is as clean and easy to use as this. The front panel boasts just the basic transport controls and the display is clear enough to be useful from a distance. Round the back, there’s the standard stereo RCA analogue outputs augmented by coax and optical digital connections – the latter are essential if you want to use this player as simply a transport. Build is pretty much par for the course at this level, with a neat finish but relatively insubstantial-feeling casework. The transport mechanism works well though, going about its business with a minimum of fuss and not much noise. The designers have taken care with the power supply arrangement and circuit board layout in a bid to optimise performance and reduce distortion. As with any CD player, there’s little to do as far as set-up is concerned. The NAD just needs a level, low resonance support to sound its best. As for system matching, something like NAD’s own D3020 v2 amplifier or Marantz’s PM6006 UK amplifier will work well. Once properly warmed, the C 538 is a good, solid performer. It doesn’t set new standards for budget CD players, but does deliver enough in the way of detail and clarity to keep most people happy. We start with Jay Z’s 4.44 set and the NAD copes well with the (sometimes) dense production. There’s a good amount of insight and all that information is organised in a confident manner. This is an agile performer, one that renders the leading edges of notes cleanly and with precision. There could be more in the way of rhythmic drive and outright punch, but the C 538 still offers enough in each respect to keep us listening. We move onto Tchaikovsky’s 1812 Overture and are impressed by the NAD’s even tonal delivery. No instrument dominates proceedings, and the player refuses to turn aggressive when the piece becomes demanding. Dynamic expression and punch are good for the price, with the NAD able to deliver a good dose of excitement. The C 538’s stereo imaging is convincing too, without quite creating the sense of space or delivering the overall sonic authority of Marantz’s CD6006 UK. However, the player’s soundstage remains solid throughout and instruments are located with a good amount of stability. We play a range of discs and the NAD isn’t fazed by the variety of musical genres played. It’s enough of an all-rounder to please with both classic and modern rap alike, having a good balance of refinement, subtlety and attack. In the C 538, NAD has produced a likeable all-round performer. It doesn’t set new standards at the price, nor does it do enough to worry the class leader. But if you're particularly keen on the NAD sound or aesthetic, or you spot the C 538 with a discount, it's definitely worth considering.